Home eBooks Soil: How much do we value this critical resource? The European Union’s commitment to soil protection through the its Soil Thematic Strategy (EUSTS – COM (2006) 231, COM (2012) 46) and the 7th Environment Action Programme is one area that is explored, along with the very important point that soil condition underpins many areas such as food security, green growth and bio economies. 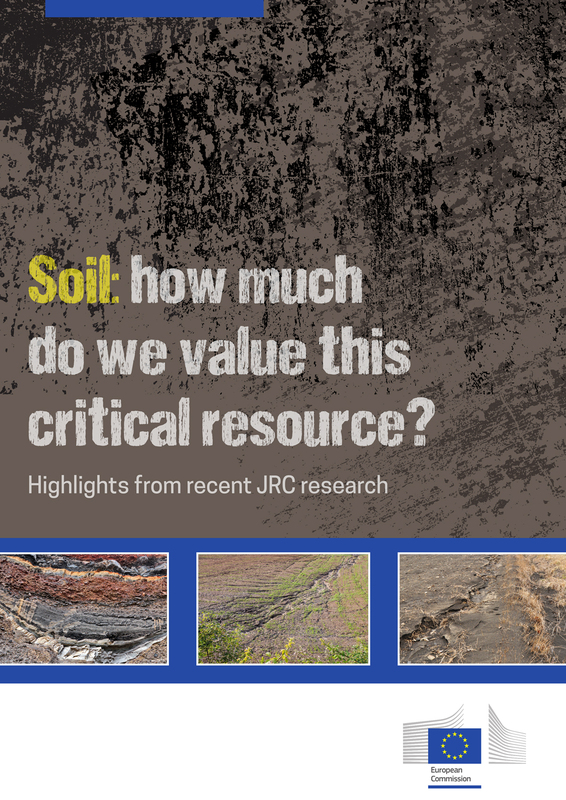 We also discover that at the Joint Research Centre (JRC), the Natural Capital Soil (NC-SOIL) project creates value-added knowledge on the complex interplay between soil and land management. Added to this, we learn that soil is an essential resource that supports many societal and environmental needs. For example, we are told about a recent study carried out by a group of researchers from the University of Basel, the European Commission’s JRC and the Centre for Ecology & Hydrology in the UK, which gave the most detailed global assessment ever of soil erosion dynamics to date. Further insight reveals that soil is increasingly recognised for its role in regulating climate either because of its ability to store organic carbon, that has been taken out of the atmosphere through photosynthesis, or as a source of greenhouse gases. The analysis goes on to underline that soil is a non-renewable resource that requires constant monitoring to prevent its degradation and promote its sustainable management. One thing we find out is that every three years, the Statistical Office of the European Union (Eurostat) undertakes a regular survey of land use, land cover and changes over time across the European Union (EU). Another is a fascinating new development in 2018 to measure soil biodiversity through DNA metabarcoding to identify, for example, bacteria and archaea and fungi. Policymakers certainly require easy access to soil data and information of various types and scales to assess the state of soils at the European level. This is precisely where the JRC’s European Soil Data Centre steps in as the primary soil knowledge hub for EU institutions today. In addition to learning more about the wonderful work of the European Soil Data Centre (ESDAC), consideration is given to dealing with contaminated sites. In summary, while industrialisation has created much wealth and opportunities for human beings, this progress has been accompanied by numerous side effects including releases of hazardous chemicals that pollute the air, water and soil. In terms of policy, we are told that the overarching objective of the European Union (EU) in this vein is to impede potential risk to the environment and human health caused by man-made contaminants. Finally, we find out that while the importance of soil seems evidently clear, it has not necessarily received the due care and attention it deserves in terms of both its use and management. The authors highlight that there is an urgent need to raise awareness on the importance of soil, especially the need to protect soil and use it in a more sustainable manner. I trust that you enjoy the many valuable and compelling insights that this publication offers.